The crossroads of religion and politics, despite its universal prevalence, continues to be overlooked and even disputed in many parts of the world. While many politicians openly admit to being religious and even publicly cite their faith as a cardinal part of their character, there is nevertheless a persisting stigma surrounding religiosity in the political sphere. Aung San Suu Kyi, the once acclaimed Burmese pro-democracy activist, is one politician who has repeatedly, albeit infamously, invoked her Buddhist faith to legitimize her unusual yet unwavering dedication to peace and nonviolence within her political party, the National League for Democracy (NLD). Since the party’s inception, Suu Kyi has continuously stressed the criticality of the movement remaining peaceful and upholding its foundational Buddhist values, notably that of metta – “loving kindness” and ahisma – “no harm”. Buddhist texts promote peace as the sole righteous way of enacting change and maintain that when unwarranted violence is used, all virtuosity is invalidated. The Pali Dhammapada, a collection of scriptures within Theravada Buddhism, the branch of Buddhism practiced and closely followed by most Myanmar Buddhists, states, “Hatred is never appeased by hatred. Hatred is only appeased by Love. This is an eternal law.” Buddhists also uphold the law of karma, an ancient belief relating cause and effect, in which an individual’s actions are believed to directly affect an individual’s future. Therefore, if a person performs good deeds, they are expected to experience future happiness, but if a person performs bad deeds, they are expected to experience future suffering. Thus, if the NLD were to respond to the military’s violent actions with retaliative force, their movement, and any future success, would be overshadowed and ultimately deterred by these “bad deeds”. Non-violence also minimized the risk of a large-scale civil war in which thousands of lives could have been lost, and equipped the NLD with a tangible moral high ground over the military. While many were skeptical of how a peaceful revolution could succeed against a violent and corrupt military regime, Suu Kyi refused to succumb to any external pressure. Finally, in early 2012, after decades of persistent dedication, it began to seem as though she and her party may have finally succeeded, but this success would seemingly be short-lived. In April 2012 the military permitted the first semi-open by-elections in half a century. While the military retained a stronghold over the presidency, Suu Kyi, as well as many within her party, were permitted to run for, and subsequently won, most of the open parliamentary seats in various districts around the country. Then, in 2015, following increasing internal pressure from various opposition parties, including the NLD, as well as external pressure from the international community, the military announced a free and open election in which all seats and positions, including that of the presidency, were contestable, excluding 25% of seats in both houses that due to specific constitutional amendments remain reserved for military MPs. 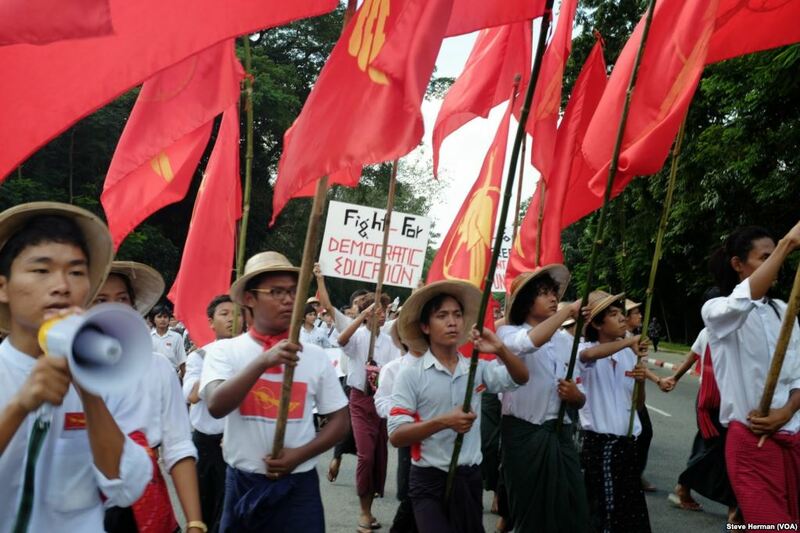 When the 2015 results indicated a likely victory for the NLD, many believed that the decades-long plight was coming to an end and that Suu Kyi and her party had succeeded in doing the impossible – overthrowing a violent regime without the use of violence – but religion would once again present itself in the public; this time not as an asset, but rather as a divisive force claiming the lives of thousands, many of whom belong to an ethnic and religious minority called the Rohingya. The Rohingya are a persecuted, non-Buddhist minority living in the western Rakhine state of the country. Most Rohingya are either Muslim or Hindu and for decades have been severely oppressed by the military simply for practicing religions that are believed by many to be foreign to Myanmar. In August 2017, violence between the Rohingya and the military escalated, leading many in the international community to label the conflict as a bona fide form of ethnic cleansing in which the religious majority was attempting to eradicate a religious minority. These developments have prompted many to revoke their prior praise towards the NLD and reinstate their unfortunate views that war is a necessary catalyst for change. Despite the prominence of religion in Myanmar politics and its pivotal role in advancing and upholding democracy, the actual influence of Buddhism has often been underplayed, likely to avoid ostracizing those who do not identify as Buddhist, mainly the Rohingya. Although Suu Kyi has consistently and publicly accredited Buddhism as being paramount to her party’s steadfast dedication to democracy, one would hardly label the NLD as a religious movement, thereby allowing religious norms to permeate into mainstream society. While recently, due to the increasing concern regarding the devastating persecution of the Rohingya people, religion has been brought to the forefront of political discussion in Myanmar, its historical roots and the breadth of its true influence are often left out of the conversation. Unfortunately, the lack of transparency surrounding the involvement of Buddhism in Myanmar politics has not decreased its role but rather allowed for Buddhist values to gradually become accepted as the norm both within the political sphere as well as generally within all facets of the public sphere. The role of Buddhism in Myanmar society has also grown with the emergence of a new, progressive branch of Buddhism dubbed “Engaged Buddhism”, which encompasses the growing politicization of Buddhist monks and Buddhist teachings, both of which advocate for the application of Buddhism to otherwise secular social and political activism, thereby making Buddhism all the more present and religion all the more divisive. The question regarding the rightful role of religion, and the varying extent of its influences, is widely thought to have originated in the Western sphere, specifically in the United States following the constitutional separation of “Church” and “State”, which was originally championed in an effort to limit the divisive tendencies of religion. Although this separation did not quite eliminate religion from politics, it did initiate an unforeseen stigma surrounding not only the practice of religion in the public sphere, but any mention of it as well. While these efforts were introduced to promote peace, religion is a deeply internalized force that cannot necessarily be compartmentalized at will and as a result many dominant Christian values were accidentally introduced into politics under the guise of secularity, thereby leaving a pseudo-secular yet ultimately religious public sphere. Over time, America’s acclaimed right to freedom of speech has enabled calls for greater transparency, which have revealed and raised questions regarding the actual involvement of religion in American politics and its possible, and seemingly troubling, consequences. Although religion can be divisive, excluding it from the public sphere will not make its influence any less pervasive; in fact it can often do the opposite, such as in the case of Myanmar. The Buddhist values that enabled the democratic movement in Myanmar and the more extremist Buddhist positions held by large portions of the military, especially those being invoked to oppress the Rohingya people, have held significant influence in Myanmar politics for decades. Increasing the awareness and advocating for the transparency surrounding the actual involvement of religion in Myanmar politics, especially the small-scale influence of Buddhism on even the most mundane of policies, is critical to its future success as an inclusive, democratic nation.